Overview: Once we had a thought of visiting the North-East of India, the first task was to decide on what states to visit. After some thought we finalised on Manipur and Tripura. Now to come up with an itinerary, it was an uphill task, because all the districts in Manipur and Tripura are full of surprises, so arriving at the places to visit was difficult. So finally we selected a mix of nature, heritage and culture. Day 1: We landed in Imphal at 9:30am and the cab driver arrived at the airport at the right time. 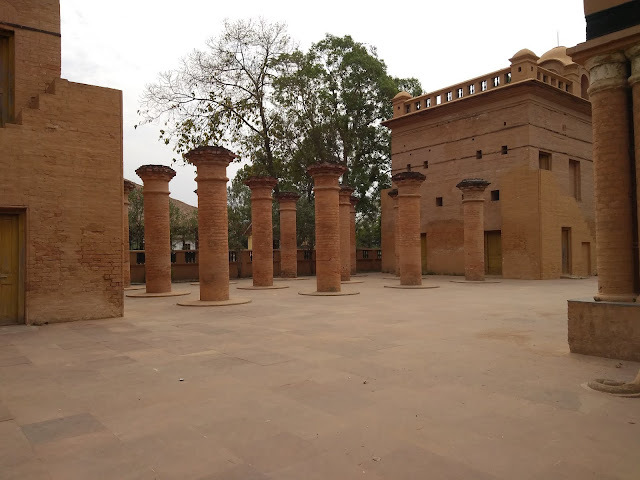 Our first place of interest was the Kangla Fort.Believed to be in existence since the 1st century CE with the Ningthouja dynasty under Nongda Lairen Pakhangba. Encircled by the traditional 4 divisions of the state, the area includes the burial places, sacred sites, megalithic mounds and places of worship. Some of the important historical structures in the fort are the Citadel wall, the Kanglasha, Sri Govindjee temple, Bir Tikendrajit temple and Gen Slim's cottage. The ancient Govindjee temple, now in ruins, highlights the temple architecture of Manipur. There is a small cafetaria inside the fort, which does not have much to offer except tea and coffee. From here we went to the cultural heritage complex at Andro. This is one unique kind of a museum, displaying the rich tribal heritage of Manipur. Thatched houses can be seen with traditional potteryware, and wood art. Also there are a set of stones, which are carved by some interesting figures like animals, eyes, and some unrecognizable images. We could not see anyone in the complex, so we struggled a bit to find more info on these stones. This site also might have had an old temple complex, where several images of Gods are displayed in an enclosure. Most of them date to the 19th century CE. Next we went to the Khongjom War Memorial Complex, dedicated to the martyrs of the Anglo-Manipur war. The complex is well landscaped with fountains and gardens surrounding it. We relished a Manipuri snack called Kelichana, just outside the war memorial. Post lunch, we checked into Elora hotel in Moreh. Moreh is a small border town, with very limited facilities. Hotel Elora is the only good hotel offering good facilities in town. Wow! This was a nice peek at Manipur :) NE India has been on our wishlist for quite some time now, hopefully this year. Very informative and interesting blog about the lesser explored places of India.